I have reviewed and written articles about books over the years, but this is the first time I’ve covered a book that’s in a language I barely read. Considering how long I’ve lived here, I can handle some German, but not well enough to digest 445 pages. So this writing is not really a book review, but more of a “notice of publication” of something extraordinary, hot off the press. When, after over 30 years of collecting, you wind up buying a brand new book that’s the largest (and most expensive) in your vast collection, you have to say something – and with a book this good, you have to tell everybody! Admittedly, many of the pages are filled with easy to “read” glorious illustrations – beautiful photos of incredible toys, games, mechanical puzzles and jigsaw puzzles. Included are sections on playsets, building sets, balance toys, optical toys, skill and action games, fortune-telling cards, doll and “homemaker” sets, geographical games, political games, lotto, tangrams, and the like. Some of the jigsaw puzzles, interestingly enough, are referred to as “Patience Spiele,” or “solitaire games,” while another sort are “three-cornered” puzzles, each piece in the shape of a triangle. Some of the many categories include board and dice, geography, educational, mechanical, magnetic, and “laying” games (“Legespiele”). The book – entirely in German – is Frühe Spielwelten – Zur Belehrung und Unterhaltung, which translates as, “Early Game Worlds, for Education and Entertainment.” It is based on the toy catalogs of Peter Friedrich Catel and Georg Hieronimus Bestelmeier, two men, merchants in Berlin and Nürnberg, Germany, respectively, who independently were pioneers in promoting toys and games outside the German-speaking area in the late 1700s and early 1800s. Swiss author Thomas Stauss, a hydrologist and soil scientist and a technical editor in private industry, has, over the last 25 years, broadened his interest in the culture of play in the 1800s, and brings his scientific approach to this work. He began the book in 2007, and his primary task was to find examples, still existing today, of some of the objects found in Catel’s and Bestelmeier’s catalogs. The result is the copious amount of glorious photographs – many of them full-page — of toys, games and puzzles found in libraries, museums, archives and private collections. 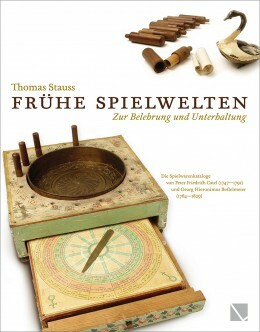 Besides providing a biography of the two key figures, Catel and Bestelmeier, Stauss examines the culture of the time around 1800 when games emerged as ways to help educate. Industrialization allowed such games to be produced and marketed throughout Germany and beyond. All in all, this amazing book, Frühe Spielwelten, is a cornerstone in a select niche of game history. It has provided me with a great incentive to truly learn German.